If you’ve been constantly refreshing your browser window hoping to see if the MSI Wind was on sale at Amazon, Newegg, or other retailers yet, you can lay off the F5 button. 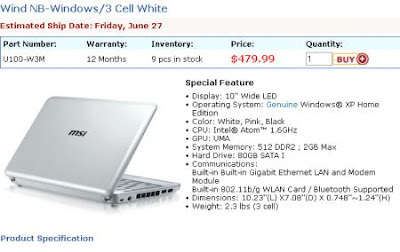 While the $499 laptop as supposed to drop today, it looks like MSI has updated the estimated ship date to June 27th. You can find mro eetails at the MSI Shop web page. The price for the Windows XP model has also fallen from $499 to $479. But before you go thinking the company is just compensating you for having to wait an extra week and a half, note that MSI is selling this PC with a 3-cell batery instead of the 6-cell battery that we’d originally been told would come with the Windows XP model. This is likely due to the global battery shortage resulting from a fire in a battery plant earlier this year. On the bright side, both the black and white models should be available at the same time. No word on when the $399 Linux version will ship. You can place orders now. I assume if you do so, your computer will ship on June 27th, or as soon as they become available. I’m a little relucatant to place an order myself at the moment, since I’m moving on July 1st. Hopefully I’ll be able to find a Wind NB at a retail store in New York on June 27th. MSI is limiting sales to one per customer at the moment due to limited availability. And the web site is incredibly slow right now, probably because it’s getting hammered by angry/anxious netbook customers. I’ve done all I’m most likely to do in terms of subnote posts on my blog, so I’m passing this on to you. Wow, that’s nice. Not quite perfect, but pretty darned good. Sigh…. thats all I can do… MSI failed us…. hyped the machine all up, and left us out to dry. I’m gonna gut it out and order the linux version now, unless something else comes out between now and then. I am visiting New York from the Netherlands next weekend, and am very much intersted in buying the Wind. Could you post if you find a shop which sells it on the 27th. The contest runs through the end of the month (it started a week ago), and the winner will be announced on July 1. Interest in the netbook has been good so far, with nearly 400 people having already submitted entries. Indicative of the mainstream interest in the device class as a whole, I suppose.